Let’s do shrimp fajitas and margaritas and call it a day. Darn it. Why am I always a day late with Taco Tuesday? ALWAYS. It never fails. Oh my gosh. This meal is so packed with flavor that I had to tell you about it ASAP. It’s really freaking good. Like fantastically good. Fajitas are one of our go-to super easy meals. 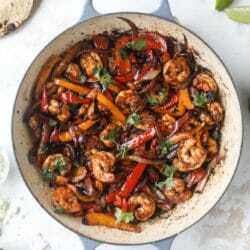 I shared that in this post with our favorite flank steak fajitas, but we often make them with shrimp and chicken too! Right now we’re doing lots of seafood because we tend to have salmon once during the week, and we’re having fish on Fridays for Lent. Speaking of, last week Eddie attempted to kill us because he brought home fish sandwiches from Primantis. I mean, if you’re not from Pittsburgh that probably means nothing, but you can eat approximately one sandwich every five years or else you have a heart attack. You know. Just fries on the sandwich. And coleslaw. But! I must say that the fish version is actually light, as ridiculous as that sounds. It’s really good! Back to the subject at hand. Shrimp fajitas. My favorite way to do these are on the grill, regardless of the protein choice we’re using. The smoky flavor is amazing and it’s tough to get that without the grill – but our marinade here is a winner. It helps, for sure. And it has a kick too. A little bit of heat. And if I like it? Then you’ll probably like it because I’m the biggest wimp when it comes to spicy food. So these, with a super icy margaritas on the rocks. Lots of salt. Let’s do it. 4 tablespoons canola vegetable or grapeseed oil or a higher heat oil! In a bowl, whisk together the garlic powder, chili powder, paprika, oregano, salt and pepper. Pat the shrimp dry with a paper towel and place it in a ziplock bag or a baking dish. Drizzle 2 tablespoons of oil on the shrimp and toss. Place the peppers and onions in a separate bag or dish and drizzle them with the remaining oil. Divide the seasoning mix evenly between the shrimp and peppers - cover each with half of the seasoning and toss well. Stick both in the fridge to marinate for 30 minutes. When you're ready to cook, heat a large nonstick skillet or pan over medium-high heat. I don't add any extra oil because there is often some residual from marinating, but add some if you feel you need it! Add the shrimp first (in one layer, so you might have to do it in batches) and cook until pink and opaque. Remove the shrimp and set it aside on a plate. Add the peppers and onions and cook them until softened and almost charred, about 5 to 6 minutes. Turn off the heat. Add the shrimp back into the peppers and it's ready! Serve with your tortillas of choice (I like to use corn here), crumbled queso fresco cheese, avocado, fresh cilantro and a spritz of lime. THE BEST! And guac! Don’t forget it. These look amazing, but it reminds me that I’ve never figured out how to successfully heat corn tortillas. I’ve tried microwaving and heating in a pan, but they always just crumble as soon as I try to fill them. Any suggestions? so i actually char mine on my gas stovetop! haha. but when i’m doing this for a crowd, i wrap the tortillas in foil and stick them in the oven (maybe like 250 degrees F) for 10 minutes or so! I also char them using my gas burners….even for a crowd! Toast them all at once, wrap in foil, and then warm in the oven when you are ready to serve. They hold up, even if they sit at room temperature for a little while. That way, you don’t have to sacrifice on that charred flavor (which MAKES them, in my opinion!). Works for both flour and corn tortillas. LOVE the sound of this recipe, too, Jess! Approximately, how long do you cook the shrimp? Colorblind here. Recipe looks amazing and I will definitely make it. Thanks. hi! i cook them for about 2 minutes per side! These fajitas look so good! Making this tonight!! Looks delish! These sound perfect! I make fajitas all the time because they are so darn easy and I can usually get two meals out of them. It will be nice to switch it up with shrimp! Also, I do your corn tortilla trick on the gas stove top and it’s so great! We are eating these right now and they are great! Thank you for your recipes! Can you use regulae chili ?? regular chili powder? yes for sure! Thank you for sharing a wonderful Fajitas recipe. My husband really enjoyed it and said that he still cooked it. Second picture from the top… Just give me that and a big spoon. No need for tortillas! I am wondering if pink shrimp will work for this recipe? Does it matter what kind of shrimp, as long as it is peeled and deveined? Thanks!